How Do Tar-and-Chip Driveways Compare in Cost, Etc.? How Do Tar-and-Chip Driveways Compare to Others in Cost, Etc.? Pros and Cons of a Driveway Material Also Known as "Macadam"
Roads across the world have been built using the tar-and-chip method. Many homeowners trying to decide between the different types of driveways have never heard of tar-and-chip driveways before, even though many roads have been paved with this material. And that is too bad because they compare favorably to other kinds of driveways in terms of cost, durability, maintenance, and more. Their pros far outweigh their cons, so further efforts on your part to research this subject may well prove worthwhile. What Is a Tar-and-Chip Driveway? First, we need a brief introduction to just what this type of driveway consists of. This kind of surface is also called "Macadam." This name derived from its creator, a Scottish engineer named John Loudon McAdam. Roads built this way were originally water-bound, before evolving into the tar-based versions we have today. The problem with the water-bound version was that it allowed too much dust to be kicked up, a problem remedied by the use of tar as a binding agent. This evolution accounts for why you may also encounter the term, "tarmacadam," which retains the original "Macadam" while updating it to reflect the improvements that come from the addition of tar. Incidentally, the term has been shortened to "tarmac" and used to indicate an airport runway, although most such runways are now constructed in a different manner. Hot tar (liquid asphalt) is applied to a gravel base. So much for the "tar" part. As for the "chip" part, while the tar is still piping hot, stone chips are thrown on top, so that they can adhere to the tar. Since a major selling point of tar-and-chip driveways is their looks, people usually make sure the stone chips are pretty, not just any old stone chips. For instance, you might want stones that are a particular color. 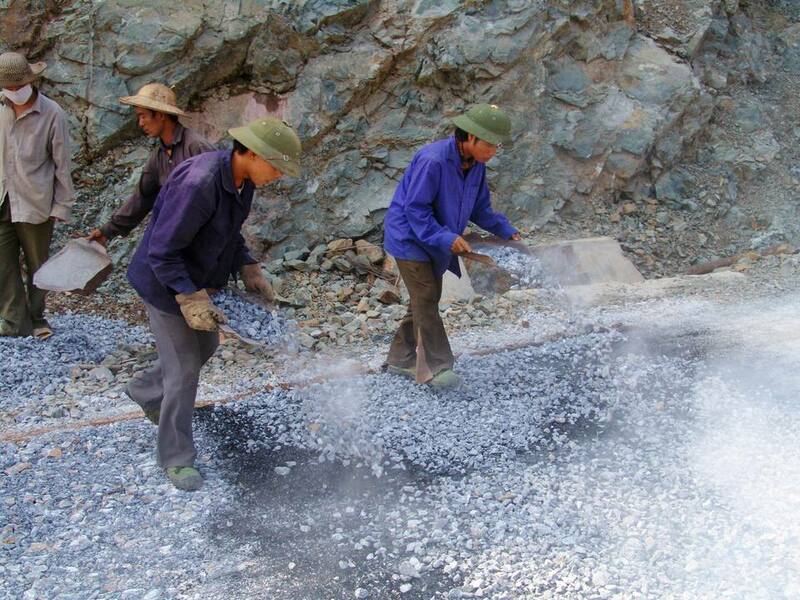 After the stone chips are laid on top of the tar, a steamroller presses them in firmly. What Are the Pros and Cons of Tar-and-Chip Driveways? Cost: They are cheaper than asphalt and quite durable. Care: They are low-maintenance (just occasionally replace displaced stones). Safety: The rough surface potentially affords good traction. It is difficult to find driveway contractors for the installation. Snow removal is difficult and could even result in damaging the surface. Besides their splendid appearance, tar-and-chip driveways also cost less than asphalt, nor do they have to be sealed the way asphalt driveways do, thus cutting down on your yard maintenance (and, therefore, your costs). Tar-and-chip driveways afford good traction since the surface layer is composed of individual stones. So rather than having a smooth and potentially slick surface like asphalt, the surface of tar-and-chip driveways is rough. Just make sure that you find a contractor who comes highly recommended because, if not properly constructed, the same characteristic that gives these surfaces traction also makes them more difficult to plow and shovel, due to all those individual little stones sticking up. If you wish to be extra-cautious with your tar-and-chip driveway and keep any loose stones in place, instruct your plowing contractor to keep the plow blade up slightly off the surface (hopefully, your contractor follows instructions well). But unless you plan on having that leftover one inch or so of snow melt off pretty soon (as it might on, say, a south-facing slope), you may be losing some of that good traction for which tar-and-chip driveways are known. In cold regions such as New England, an inch of snow can stay around for a long time (especially on a flat surface), and it will generally ice up, creating a hazard. Tar-and-chip driveways can be a beautiful addition to your landscape. An additional advantage to tar-and-chip driveways is that oil leaks are more easily hidden on them than on asphalt or, especially, concrete driveways. Finding a contractor to install a tar-and-chip driveway, however, may be a challenge, as tar-and-chip driveways are not nearly as popular as asphalt paving, concrete driveways, and gravel driveways. Heated Driveways vs. Portable Heating Mats: What's the Difference?